yep. Lots of help. Or “Ope”, as Kajsa seems to call it. She loves to “ope”. only when it comes to packing, it’s not really that “opeful”. helpful in terms of keeping her busy for awhile, at least. She decided the other day to help out by packing her toys. So she started to pack individual pieces of her Marble Works toy, in individual sheets of newspring/advertisements. 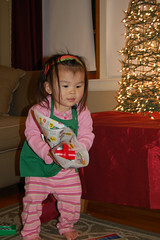 At least it kept her busy, and away from taking stuff out of the boxes I was packing! Check out my other recently-uploaded photos (uploaded today), for a preview of what we’ve been doing over the past few days. Mostly. I have yet to upload photos of today–the Lucia celebration at church, and the farewell piece of that celebration. And the surprise I had when Deb L. (Aunt Deb) dressed Kajsa up to be in the Lucia party. I was in tears, when I saw Kajsa in the outfit. Adorable. And I’ve been on the verge of tears the rest of today. I’m so excited to be in Harleysville, and I’m having such a hard time saying goodbye to many people here. Whew. It’s gonna be rough. As one lady in Harleysville said, when she wished us blessings on saying goodbye out here, “Just remember that there’s a congregation out here that is very excited to welcome you.” Good to remember, as we transition. Meanwhile, the packing continues. The Open House happens again tomorrow. Hopefully another Lucia party tomorrow, if we’re still awake by 6 p.m.
for more pictures like this, go to my flickr page, and see the “set” titled “Thanksgiving Weekend”. A busy, busy weekend. But loads of fun and things to do, including the preparation for the Century 21 Open House. 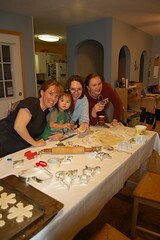 This year’s cookie-baking and decorating was purely for fun, not for sharing at our normal Open House. No “normal” Open House this year–just real estate ones. Jo Ann and Kristina (aka “Bean”) were both here this weekend. Kajsa was in heaven. Between that, and the Thanksgiving meal with Rob and Jen… it was fun. And the food was great. Jo Ann and I patted ourselves on the back for the good turkey… that literally fell off the bones. Rob and Jen brought a good salad and great broccoli casserole.. mmm mmm good. Steve, Kathy and Kia stopped by the next day for coffee. This is such a shortened version of the weekend, but that’s all there is right now! Check out the photos.